Posted by J Cole Morrison on February 8th, 2017 . 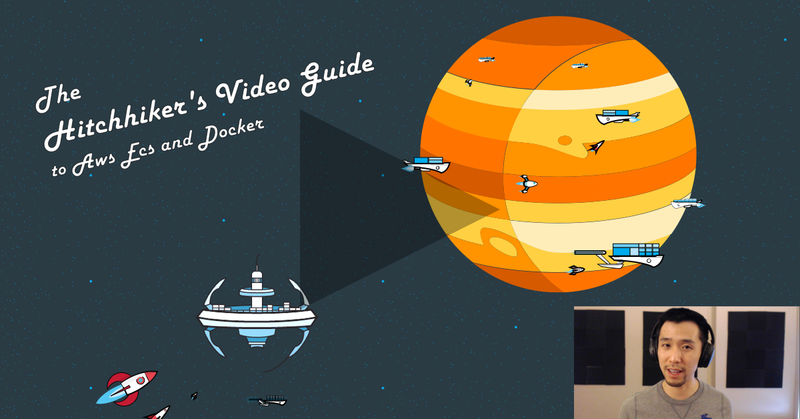 Setting up unified CloudWatch logging in conjunction with AWS ECS and our Docker containers. Ease of administration for our infrastructure is paramount... It's not the "hottest" topic, but when traffic is burning our servers down and customers are complaining about errors - logs are your best friend. Also, Docker bragging about unified CloudWatch logs in their "Docker for AWS" service struck me as odd. And then I thought about it - AWS doesn't make it exactly apparent on how to set all of this up. Yes it's there, but as with everything AWS Docs, you wind up fishing around for hours on in combined with lots of tinkering. The Second set are logs straight from your task containers. For example, if I have a Node application running in my task, the logs from that application will be sent to CloudWatch as well. 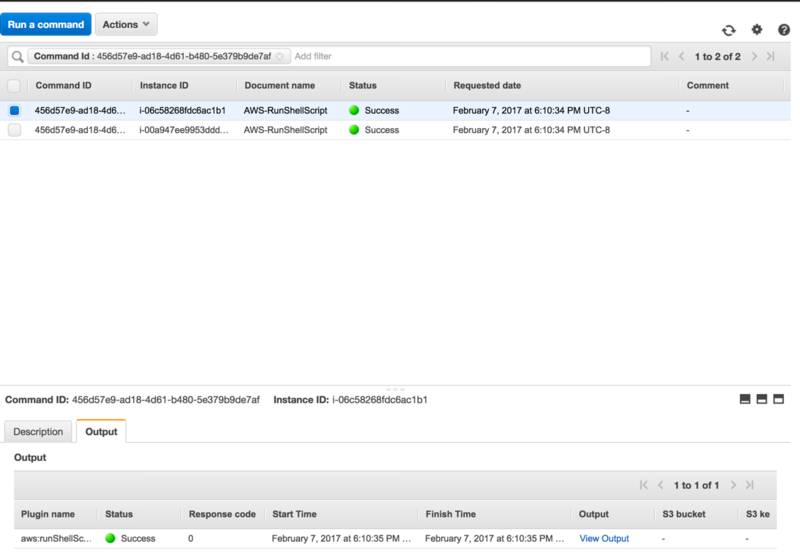 AWS Console > CloudWatch > Logs. Run Command to Rule Them All? 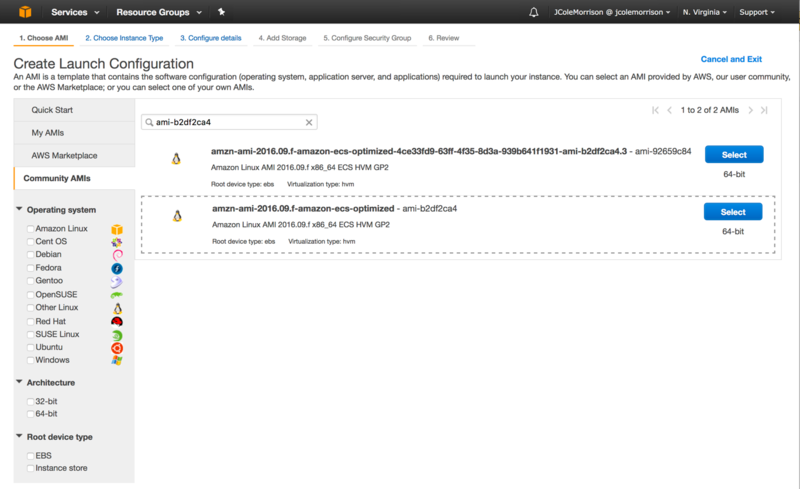 AWS has a fun sysadmin tool called Run Command. It allows us to..
Optionally we can, from that output, pipe it to an S3 bucket for future consumption or even send it to SNS, so that we can receive it via email, text, etc. It should be pretty apparent how being able to do something on all of our Server's simultaneously is a HUGE win for Sysadmin. I've already written a guide on setting up a fully load balanced and autoscaled ECS environment. Therefore I'm not going to walk step by step by step of how to setup an ECS cluster. Instead I'll (a) reference points in this guide and (b) give a good explanation of how to apply it to any process. In order to use logs we'll need to begin with IAM. When setting up ECS, our EC2 Instances that get launched into our cluster, aka Container Instances, require an IAM role. This role allows them to communicate with the ECS service endpoint and message/be managed by the cluster they've joined. In the Guide, we created this policy and add this role around Step 20. If you're setting up IAM Roles from Scratch, you'd create a new Role in IAM, search for the policy AmazonEC2ContainerServiceforEC2Role and attach it. 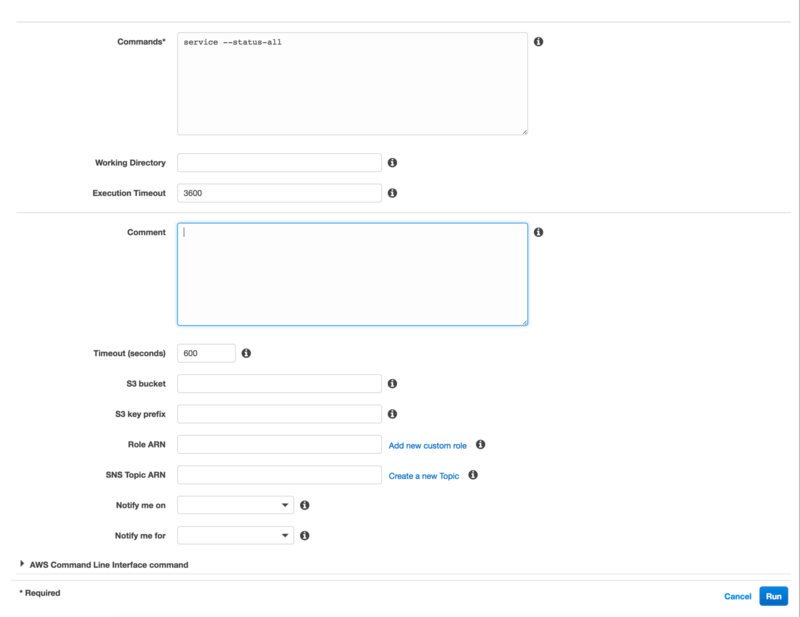 However, to allow for full Container Instance to CloudWatch functionality, we need one more policy attached. If you get a splash screen, click through it. Even though this overlaps, with the "logs:CreateLogStream", "logs:PutLogEvents", on our ECS role, that's fine. They won't collide and we shouldn't modify the ECS role directly. The other reason this works out is because if we need to allow CloudWatch logs on for other services that aren't ECS, we're ready to go. Now this policy will be available and search-able for any future IAM roles in any region or account. In Guide after Step 25, we would attach create and attach this policy then. Much like how we added the EcsInstanceLogsRole, in order to use the Run Command ... command on our Ecs Instances, we need to add one more policy. If you've followed the Guide, you've actually already added it at Step 21. Oddly enough, I put it in as a mandatory step out of pure habit. 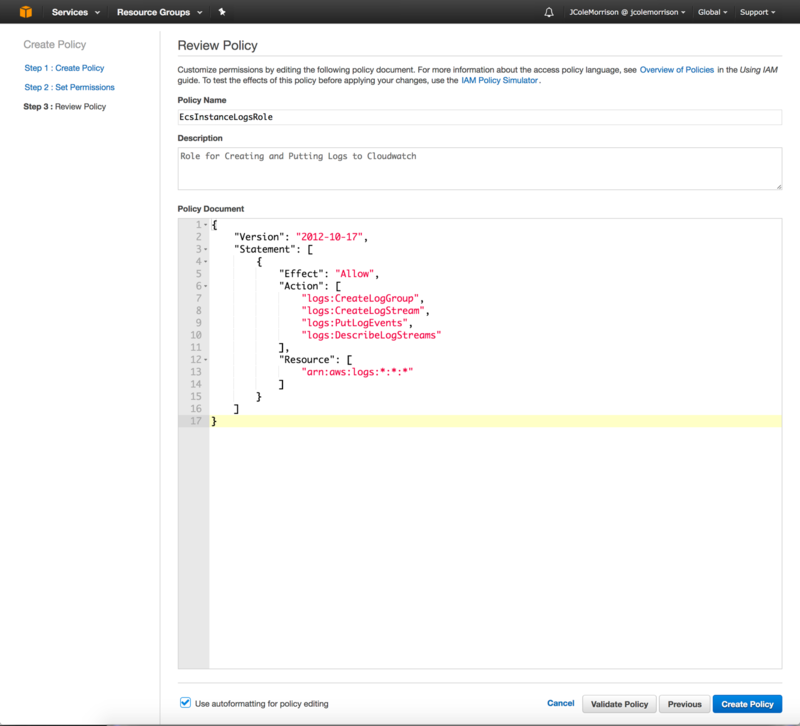 If you're creating your own Role you would do the following assuming you've created an IAM Role called EcsInstanceRole that includes both the AmazonEC2ContainerServiceforEC2Role Policy and the EcsInstanceLogsRole Policy we created. c) In the filter input, search for AmazonEC2RoleforSSM and attach it. Now let's talk about setting up the servers to actually send these logs and receive commands. I'm including this simply because, if you've created a cluster from AWS's first time wizard OR created it using anything other than an empty cluster.......... AWS will not respect changes to your scaling groups or launch configurations easily. Instead, when you choose to scale up through ECS, it will fall back and use the settings created when spinning up your cluster for the first time. I'm not really sure why anyone would do B. Even if doing CloudFormation, it's still best to use AutoScaling groups. A may be to test new server configurations. C, should be the way to go. This just does a through f from above. 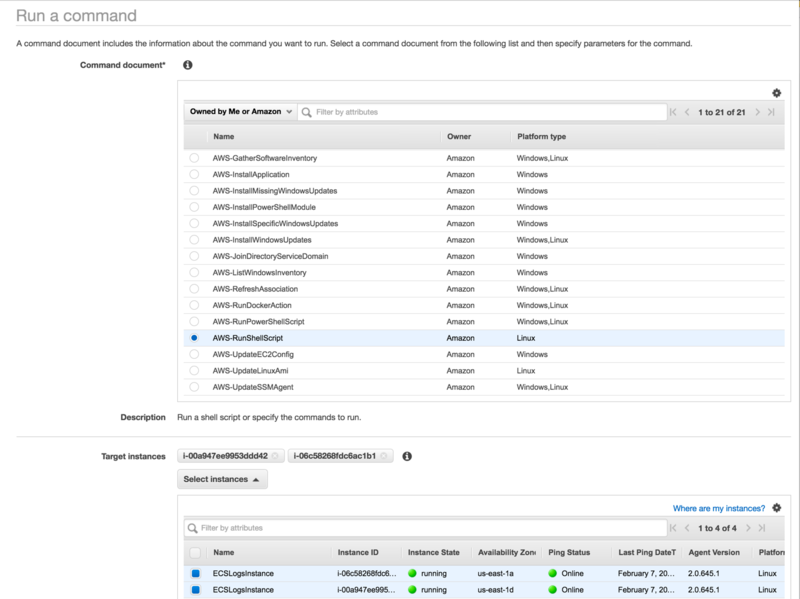 It's pieced together from lots of usage and some snippets here and there from the AWS Docs. Be sure to replace the YOURCLUSTERNAMEHERE with your cluster name. or copy and paste it in. Note: you must assign all container instances a public IP address because outside access is needed to communicate with ECS. If they're in a private subnet, and cannot have a public IP, than you must route them through a NAT Instance of NAT Gateway. 5) Continue on, setup desired storage, tags, and finalizing. 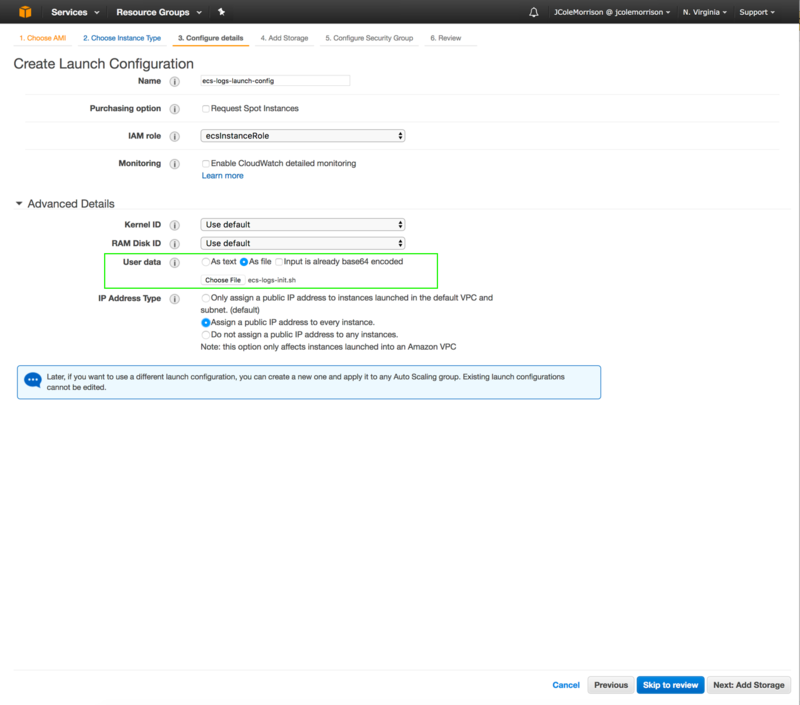 After this, you'd create an AutoScaling group from this launch configuration and tell it how many instances to keep up and to scale up to. Again, you can see an in-depth walk through in the guide mentioned above. But I already have a launch configuration, or set of servers, what do I do now? 6) Assuming you have the scaling group set to keep to a particular desired level, it will spin back up that number of instances with the new launch configuration and thus IAM Role and User Data script. IF you're automating the launch of your scripts with, another script, just make sure any new ones get the new IAM role and the mentioned User Data Script. If you're launching in instances manually.. Stop, and use a launch configuration. Will all be available in CloudWatch once the instances have gone up. We still want to setup the Task Container logs though. 2) When creating our Task Definitions, defining the logs in the Task Definition parameters. And assuming we've setup our IAM roles and CREATED THE LOG GROUP IN CLOUDWATCH FIRST, it will start piping logs to the console immediately the tasks from this new task definition are up and running. Which will have all of our logs from all of our containers in one place. They're not all mashed together either. If you drill down into say /var/log/dmesg, you'll a separate log stream for each instance. will show the logs from my sample Loopback application. 8) Leave everything else as is and click Run. Here we'll see the return of our command! Great. Need to throw a quick update to all current instances but can't take them all down? Do this. Want to pipe logs via a curl? Do this. Want to grab everything from a particular service instantly? Do this. It's amazing. 1-3 are enough for logs from the container instances themselves and to run Run Command. But not for logs directly from Containers. 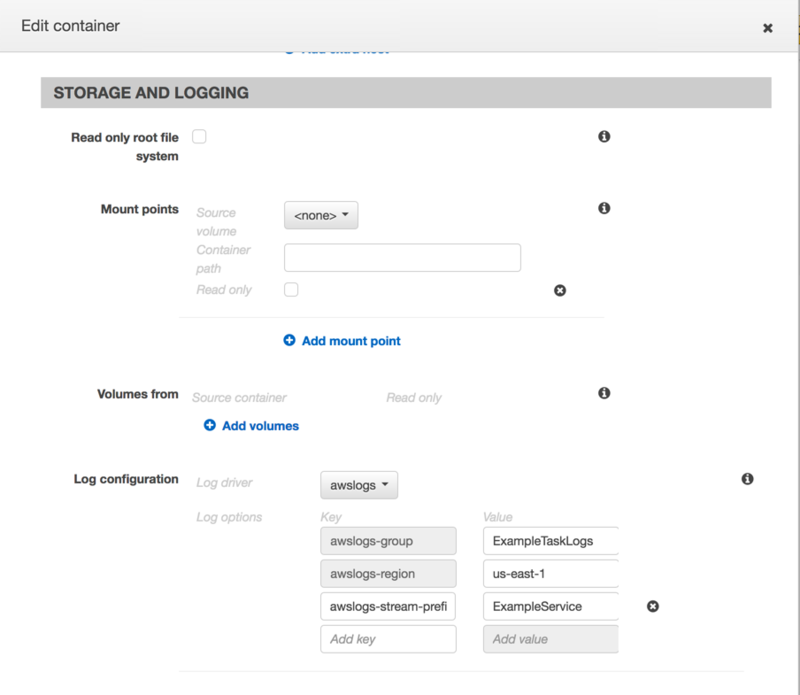 4) Setup a log group in CloudWatch for your Task Definitions that'd you like to capture logs from. either in the console directly or by JSON template. That will allow you to see all logs in CloudWatch, and run shell script across all of your instances simultaneously!